...robust - Greenlight has slid quite heavy since the end of 2014 and clients have pulled more than USD 3 billion during the last two years, Bloomberg reports. 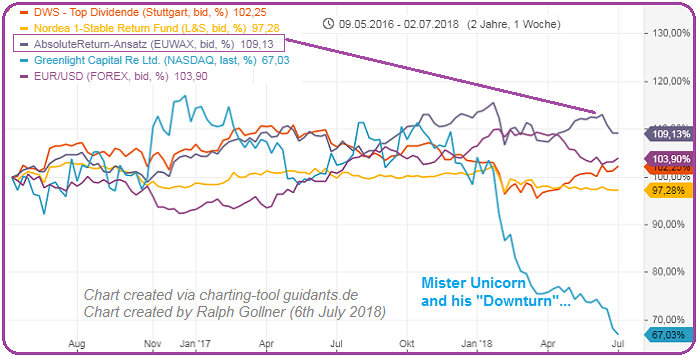 Einhorn isn't changing his tack: He's long on General Motors (NYSE:GM) and short on a "bubble basket," which includes Netflix (NASDAQ:NFLX) and Amazon.com (NASDAQ:AMZN). Here's a front-page Wall Street Journal article about how badly David Einhorn is doing: After more than a decade of winning on Wall Street, Mr. Einhorn's Greenlight Capital Inc. has shrunk to about USD 5.5 billion in assets under management, his investors estimate, from a reported USD 12 billion in 2014, and his investments are struggling. "My patience is wearing thin," said Morten Kielland, chairman of investment-management firm Key Family Partners SARL and an early Greenlight investor, who said he has withdrawn much of his firm's money from the fund. "This is unbelievable." Greenlight's main fund is down more than 25% for the year, and was down 11.3 percent from the end of 2014 through the end of 2017. This is sad for his investors, and oen may suppose: also for him. D. Einhorn, started Greenlight in 1996 when he was 27, with USD 900,000 he assembled from family and friends. For much of his career he could do no wrong. In 2002, he challenged the accounting practices of lender Allied Capital, a prophecy that eventually paid off, just as his Lehman prediction did. Every year, he was arguably the biggest draw at the Sohn Investment Conference. Value-investor groupies still consider his annual client dinner, held under the giant blue whale at the Museum of Natural History, as second only to Warren Buffett's confab. During the dot-com craziness of the late 1990s, Einhorn tells them, newfangled measures like "eyeballs" and "stickiness" never did add up to profits. In 2008, when many hoped trouble would pass, he brazenly predicted Lehman Brothers would collapse. He was right, of course. But Einhorn, who achieved widespread fame at moments of maximum danger, is no longer the enfant terrible he once was. For starters, he's turning 50 this year. And, in middle age, he has clung to his old ways even as many in his industry have moved on. Even being wrong about nearly every one of the top 40 positions in his USD 5.5 billion portfolio this year >>> "We believe our investment theses remain intact," he wrote in an April-2018 investor letter. "Despite recent results, our portfolio should perform well over time." Einhorn's this-too-shall-pass attitude puts him in an interesting spot in a USD 3.2 trillion industry invented back in the day on strategies that don’t work so well now - after a decade of historically low interest rates and the rise of passive investing and quant trading. The Einhorn modus operandi of buying the beaten-down stocks of companies he expects to grow and selling those that are overvalued has fallen out of favor. Not surprisingly, many in Einhorn’s circuit have switched up approaches, at least on the margins. Lee Ainslie and Steve Cohen have added machine learning or other quant models to help in stock picking. Dan Loeb owns Facebook Inc. and Netflix Inc., even though in his early days as a value investor he would have never bought shares with such high prices relative to earnings. or have stopped shorting individual stocks all together, using options on indexes instead. And they’ve all performed better than Einhorn in the past few years. "But how do you survive when investors and the market are telling you they want you to change? It needs to turn into his kind of market fast." Einhorn, who declined to be interviewed for this article, started Greenlight in 1996 when he was 27, with USD 900,000 he assembled from family and friends. For much of his career he could do no wrong. In 2002, he challenged the accounting practices of lender Allied Capital, a prophecy that eventually paid off, just as his Lehman prediction did. Every year, he was arguably the biggest draw at the Sohn Investment Conference. Value-investor groupies still consider his annual client dinner, held under the giant blue whale at the Museum of Natural History, as second only to Warren Buffett’s confab. As the decades passed, his wealth mushroomed. He commuted by train from Rye, New York, and drove around there in a Honda Odyssey minivan, but he did have those billionaire ways. He contemplated buying a stake in the New York Mets and trained with a professional coach for the 2012 World Series of Poker, where he came in third in a tournament. These days, stubbornly a value investor, Einhorn is long a very cheap General Motors Co. and short a "bubble basket" including Netflix and Amazon.com Inc. While this sort of approach has worked well historically, there are market cycles that can mess things up. The last bull market was a value cycle; this one is a growth cycle.